Cathead biscuits have been around for years and is an old-fashioned recipe. My mother never made any kind of biscuits except what we called “cathead biscuits” and she made them almost every day. I have seen her make biscuits twice in one day because every kid in the neighborhood loved her biscuits. We never had chips, cokes or junk food in our house back then. We did have lots of sweet tea, fresh milk right from the cow and plenty of biscuits slathered with real butter and homemade blackberry jam. Honey from my Daddy’s bee hives was always on the breakfast table to go along with our biscuits. The neighborhood kids called my mother, “Parker”. We would hear a knock at the front door and one of our little friends would be there. The first thing they always asked was, “Does Parker have any cold biscuits and jam?” A cold cathead biscuit with blackberry jam was a real treat when I was growing up. I am sure there are lots of different ways to make these biscuits but the recipe below is the way my Mama always made hers. I watched her many times when she got out the big, old crock and added flour, buttermilk, and lard. She always mixed them up with her hands and pinched off the biscuits. Mama never rolled them out and she put them in a round pan. Somehow, her biscuits always came out uniform without using a biscuit cutter. She greased the pan with bacon grease, too. The biscuits were always touching in the pan to make them rise up higher instead of spreading out and being thin. Memories of Mama in her “house dress” and apron always flood my mind whenever I make these biscuits. Oh, how I would love to have one of her cold biscuits with blackberry jam! Cathead biscuits got their name because they were said to be big as a cat’s head. Work the shortening into the flour until it’s like coarse crumbs. (I use a spoon to do this). Add the buttermilk and stir until makes a ball in the bowl. You can either pinch off the dough or cut it with a biscuit cutter. I use a tin can because I like to make these biscuits good size like my mama’s biscuits. Grease or spray pan. Bake in preheated 400 degree oven for 15 to 20 minutes until brown on top. This recipe only makes 8 biscuits if you make them like I do. 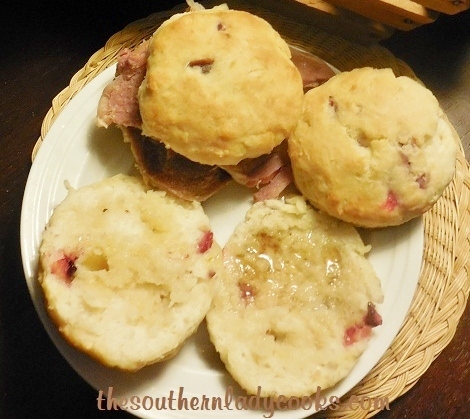 These biscuits are wonderful with a big old piece of country ham on one. They got the name “cathead biscuits” because they are supposed to be as big as a cat’s head! Enjoy! Note: You can also make them using all-purpose flour but you will need to add 1 tablespoon baking powder, 1/2 teaspoon baking soda and 1/2 teaspoon salt. You can brush melted butter on the tops once cooked or even before cooking if you like. If you like this recipe, you might also like my recipe for Sour Cream Biscuits. This Old Fashioned Recipe for Cathead Biscuits is delicious. Work the shortening into the flour until it’s like coarse crumbs. (I use a spoon to do this). Add the buttermilk and stir until makes a ball in the bowl. You can either pinch off the dough or cut it with a biscuit cutter. I use a tin can because I like to make these biscuits good size like my mama’s biscuits. Grease or spray pan. Bake in preheated 400 degree oven for 15 to 20 minutes until brown on top. This recipe only makes 8 biscuits if you make them like I do. You can also make them using all-purpose flour but you will need to add 1 tablespoon baking powder, 1/2 teaspoon baking soda and 1/2 teaspoon salt. You can brush melted butter on the tops once cooked or even before cooking if you like. Pin these cathead biscuits for later! those on the fathead biscuits. Home. I can see her now standing in front of her stove. I’m so glad I found your blog. So glad you found our blog! Thank you for your sweet comment. I love when food takes you down memory lane. Have a wonderful week. What dear memories this brings back of my own Mama’s cat head biscuits. She had a crock bowl, too. She was so adept she could make a pan of biscuits without measurin* anything. She had a Hoosier cabinet where the flour was sifted into the dough bowl. She would hollow out a spot where she worked in the lard and buttermilk, and always pinched off each biscuit. If there was extra flour left in the bowl, it didn’t matter. The bowl would be placed back in the cabinet to await the next batch. Wonderful memories! Thank you for sharing! I don’t have any buttermilk can i use regular milk instead ? What did I do wrong? Such a simple recipe. I measured ingredients exactly, but my dough came out as a very very sticky mess. Entirely unworkable. You can always add more flour to any biscuit recipe if it is too wet to make it workable. Could depend on the texture of your flour. Melinda, My MIL taught me 50 years ago to use a tin can to cut my Biscuits with … Good size ! Nowadays I try to always get the one’s lined with the white inside … They stay nice forever … After I use I just wash and put up in cabinet … Always easy to replace! : ) She made her biscuits just like this! I’ve made these delicious biscuits many times and they are my grandchildren’s very favorite. I remember balking when I read our aged family recipe calling for lard and being chastised by my mama! Her recipe called for lard the size of a “smallish” egg. Now I am old enough to appreciate these old recipes! Thanks for posting this. What great memories! So glad you shared with us. We love these biscuits too! I am making these Labor Day Weekend. Ty so much for the recipe! I prefer to roll them out as I have a biscuit cutter about the exact size of a tin can. How thick should I roll them out? I usually do about 1/2 inch, Melinda. I hope you enjoy the recipe and have a great weekend. I, too, had a Great Aunt Daisy. She was always smiling and chatty, and her cathead biscuits were to die for. Come to think of it, all the great cooks in my family made catheads and all were from Kentucky! You never visited her and Uncle Lester without eating! Thank you for sharing this! Thank you for this recipe!!! My great aunt Daisy used to make us cathead biscuits when I was little. She made enough for huge family gatherings. Some would have meat inside. She’d wrap them individually so we could take some for the road. There was always a monstrous bowl in the kitchen just filled with them! She always had this hand rolling technique that churned them out quickly and saved the mess on the counter since she didn’t have to roll them out. I adore her and her biscuits. They always felt like love. Now, as a mom of 6, I was able to relive that feeling and bless my babies in the process. They were delicious. Hers were tougher which was perfect for holding meat and not breaking apart. It was also perfect for flipping them upside down and pouring gravy over the top. I may try kneading them longer to achieve the tougher texture. I’m glad to have found your site. Much love and many blessings! Can you freeze the dough for future use? If so, does the dough have to be thawed before cooking? I have not tried freezing the dough but see no reason why you couldn’t. I would roll out the dough and cut the biscuits out then freeze them on a tray and place in plastic bags once frozen. I would cook while still frozen. I am from Iowa and my husband to be lived in the South but was going to college in the town where I lived. My mother would invite him to eat. We knew he liked biscuits so my mother made him some drop biscuits and added a little sugar to them.His mother made rolled cut ones and no sugar. Later he told me I was looking for a southern biscuit and all I could see was something that looked like a little cake with points on it and when I tasted it all it needed was a little icing. Not the southern biscuit. We laughed about it because it was funny later.He did appreciate the meals. My granny always made these twice a day – breakfast and dinner time. She would mix them in an old wooden bowl using her hands, never measured, gently rolled them and cut with a red coffee cup that no one was allowed to mess with – she kept it on a high shelf. She would daub bacon grease or cow butter on them – delicious!!! These bisquits rock! What a wonderful memory!! Thank you for sharing. Good recipe, even I can cook them. Remember 50-53 years ago as a grandson at grannies house waking up to her cathead biscuits. Lived in a shotgun house, put leftover biscuits on dinner table. Us kids would run in the house thru the front door, grab a biscuit, fill with good homemade jam and run out the back door. Super great memories. Thanks again…….Tony M.
What a wonderful comment! Thank so much for sharing! My grandmom never rolled her homemade biscuits either. She lived to be 92, and over the years, I must have watched her make biscuits a hundred times. She pinched off a piece of dough, rolled in into a ball and then flattened it on the baking pan with her palm. She then took her thumb and pushed a thumbprint into the middle of each biscuit and then took a fork and punched a few holes into each thumbprint. Not sure why she did all of that, but her biscuits were to die for. Oh, and she always used lard in her biscuits, something that almost nobody does these days. I grew up in southeast Tn and it was my “Granny” (whose maiden name was Parker by the way) who I remember making these biscuits. She also made them at least once a day and often more than once. Your description of watching your mother was pretty much spot on with my grandmother, right down to the “house dress” and apron. How I do miss that woman. My Mom does a fair job of re-job of re-creating Granny’s biscuits but I live too far away way to get those very often. My mother-in-law also made a fine biscuit but her health has declined to the point where she just can’t anymore. So, its about time I tried my hand. Such a great story of your grandmother, too, Tony. Thanks for sharing. It’s a small world really and what a coincidence her maiden name was Parker. Parker was my mother’s married name. I hope you enjoy these biscuits. Have a great week ahead. The same “cathead” biscuit dough can be used to make the fluffiest dumplings for chicken and dumplings … they come out like little clouds. I once had a neighbor who swore he hated chicken and dumplings, cause the dumplings always came out dense and doughy. I made a pot full one day, and brought him some and he was hooked. My grandma was from South Carolina, and she was the one who introduced both the term “Cathead” biscuit and the love of them to me as a child. Everything you wrote on this recipe, was my whole memory of my Mom, making our biscuits, right down to her house-dress…blackberry jam and butter..But after moving to Mi. From Tn. we had the store bought butter…Also, the recipe was exactly the one my Mom used, I had never heard them called “Cathead” but that will do…Oh yea, My mom also rolled them and pinched them off also…uses a round pan and placed them all together also..they were always just perfect and so soft. This makes me want to try making them again…lol Thanks you for the wonderful memories…. Thank you Jani for being a part of the site and for letting me know about YOUR Mom. Hope you enjoy the recipe and happy to have you here. have eaten them when I was a child –our housekeeper made them every day for our family. Always works excellent for me. I know this sounds like sacrilege, but Hardee’s makes a pretty good Country Ham Biscuit, also some McDonald’s have them, but not all. That is, if you are unable to make the biscuits or find the ham, or if you happen to be traveling during the breakfast hours. I’d never made biscuits from scratch before I found your recipe. I tried some cut and some pinched and by far love the pinched ones better. This recipe worked great even though I had to make the buttermilk substitute(ie. w/ vinegar) keep sending the great recipes. Happy you enjoy the recipe and happy to have you on the site. Thank you for your comment. You ain’t lived till you have made southern biscuits from scratch! There are as many recipes as there are southern cooks but you very seldom find a bad; one…they just get gooder & gooder! I haven’t tried these biscuits yet, but had to let you know how very much I enjoy reading your growing up memories. They warm my heart and make me wish for that more simpler way of life. Your stories make me think of The Waltons! Thank you for sharing. Would I be able to add any whole wheat flour? You can try it Donna. I have never tried adding whole wheat flour to this recipe. I have. Tasty! However, the whole-wheat flour is heavier and requires more (half again? quarter again?) baking powder or your biscuits will be flat and dense. When I make bread with all whole-wheat flour I use almost half again as much yeast. Also, I keep my whole-wheat flour in the freezer, so I have to measure it out and let it warm up a while before I make the biscuits. My mom grew up on a farm in Florida with 8 brothers and sisters. They lived off the farm and ate what they grew, made butter, gathered eggs, and etc. On Saturday, they would ride the wagon pulled by the mule to “peddle” their buttermilk and eggs to buy sugar and other items that could not grown on the family farm. I love to hear my mama tell me stories growing up. They lived on 320 acres of land and helped out on the farm daily from dawn to dusk. Her Mom taught her how to make “cathead” biscuits. When I was growing up, Mama always made homemade biscuits at least once a day. My favorite meal for breakfast (and still is) is biscuits and tomato gravy. When I lived in San Francisco, CA for 8 years no one knew what cathead biscuits or grits were. I live in Alabama now and when I go to visit my Mom (3 hours away) at least once a month, she always makes her “cathead biscuits and tomato gravy for me. Great story Cheryl. Thank you for sharing. I grew up a lot like your Mom and have always been thankful for the lessons I learned on the farm and growing up. Happy to have you on the site. Cheryl, your Mom sounds like my grandmother. Her biscuits weren’t big and fluffy though. They were thin and more crispy. And, Southern white gravy made with meat drippings was our gravy of choice. Wasn’t it wonderful, tho, growing up in the South??? What is Red Gravy or Tomato Gravy and where can I find your recipe? My mother died and I never did get her gravy recipe. My grandmother or mother made biscuits every day of the year and sometimes two or more times a day. Mama would sift self rising flour into a big wooden tray, rake a hole in the middle, add the lard and buttermilk, then gently mix all together incorporating more flour until she got the texture she wanted. Never measured anything. She would then pinch off a bit of dough and roll them around between her palms. They were always smooth on the top, and I have never managed to get that part right. Sometimes we would put a hole in the biscuit with our finger and fill the hole up with cane syrup. Good memories, delicious biscuits. Exactly the way my mom made her biscuits. I haven’t mastered yet and I’ve been trying for years. It just means to take a piece of dough off the whole piece with your fingers., Jacquie. Have you ever done a large batch and froze them? If so, any heating recommendations? About like mine as well, but I do use vegetable shortening and a little more than you call for. I like my biscuits to be a little thinner with more “crisp” edges to them. Mother always did her withe her hands as well, but I do pat mine out and cut them with a glass dipped into flour. Hers were baked on a flat iron griddle and I put mine on a regular cookie sheet. Oh, so good. That’s how I’ve always made my biscuits, that’s the way my mom taught me…. Good luck Debbie. I know you can do it. Happy Mother’s Day to all. Thank you for your precious memories! Such a pleasure to read. Thank you for the wonderful recipe too. I have access to real buttermilk, ie, left over from making butter. Can I use that or should I use cultured buttermilk from the store. Thanks! Can’t wait to try this recipe! All you have to do is click on the picture of the little printer at the bottom of the recipe, remove the photo and any text you don’t want and print the recipe. I don’t see how it could be any easier than that????? I have been watching those biscuits being made for 3 generations! Nobody can seem to get their fill of them! I have tried all my life to roll that cathead from my hand to the pan! They look real good and tops are so pretty! But they are just as hard as any rock you can throw! I can spoon drop them or cut them out and they are yummy! But the texture is not the same as the hand to the pan method! My mom is always making these biscuits (40 biscuits) to send home so that my grown family can eat have 10 for their family! We LOVE Nanny’s biscuits with some good Blackstrap sorghum and butter! It is good to know that there are many old fashion biscuit makers out there! My Mama made biscuits every single day as we grew up and made them this same way; and pinched them off; never rolled or cut. We had our own cow, milk, buttermilk, butter, cream and it all made for the best biscuits ever. We lived in the country and the little girl who lived on the next farm would come to see us in the afternoons; her father was from Holland and she’d bring my Mama some beautiful tulips and then sit down and have biscuits with butter. What a cute memory. She was known to be quite the cook in the community! Those were the days! Miss her so much! I make My biscuits similar to these. I only mix the flour an milk. Grease a iron skillet with hog lard then pinch out the biscuits, put in skillet an brush tops with melted lard. These can sit out all day an want get had. I just saw this recipe and wanted to try it but I don’t have any shortening right now I just have veg. oil. Can veg oil be substituted in any way? My mom always called her biscuits “catheads” but I never knew where the term came from. Brings back warm memories. Thank you so much Kristie! So happy you enjoyed the biscuits. I am from Brooklyn, NY but was raised as a young girl in Orange, Texas. My family is from Louisiana and breakfast was not complete without some good ole’ biscuits. We ate them with Stein’s syrup and bacon. Listening to country music at the same time. I remember my grandmother’s house dress and boy did a miss her. Good times…blessed to have had them!! This is how I’ve always made biscuits too. As a young wife I decided to make perfect biscuits, I rolled & cut the biscuits out, making them just right, my husband came to the table & ask what happened to the biscuits, I answered I made them pretty, He said well I like them ole cathead biscuits you make, They’re big enough a man knows he’s had something to eat, pretty don’t feed the bulldog! That was over 40 years ago & anytime I see pretty little biscuits, I always think of him. My Papa made “cathead” biscuits in a big wooden bowl. I always thought he named them cathead!!! He would make these with squirrel gravy. Not real squirrels though– he would say he saw one in the tree and made the gravy. I loved these cold with ham and a little mustard. Amazing how similiar peoples lives and memories are. No it doesn’t taste like country ham I had when I was a kid (growing up in Ky). I can’t find any in Ohio that is good neither! Cliffty farm Makes a darn good country ham. we only get them around the holidays here in White Hall, Arkansas. you can buy them in Tennessee in almost any grocery. Where do you find ‘old county ham’ anymore? My husband has been trying for years (he’s 80 now) and he says the ham today doesn’t taste like ‘ old sugar cured country ham’. anymore. We’re from KY and have looked down there as well. I know what your husband is talking about Joyce. We used to cure our own hams and they were much better than the country ham today. There are several country ham places in Kentucky and they sell country ham in the groceries here but it’s not like the country ham we used to cure either. Check out Benton’s in Madisonville, TN. Fantastic country ham and bacon. I AM gonna try these …they look so good !!! Since we no longer have easy access to lard or real buttermilk, which is what your mother used back then, would these taste a lot different today, with shortening and cultured (fake) buttermilk? I’d love to go back in time and try the ones Parker made! They are very similar, Jenny, but not exactly the same. Although, I don’t think anything ever tastes like what our mothers made. I don’t know about the lard, but I always make my own version of buttermilk with whole milk and a couple teaspoons or a tbs of lemon juice. Let it sit for 10 min. or so. And no, nothing tastes the same, but we can come close. These biscuits were great ! I made a cookie sheet full ( about 20 in all ) and they wrre gone before noon time . I will try these very soon ,I’ve never been good at making biscuits my mom made really good ones. But I don’t have her here anymore to make me biscuits. The less you handle them, the better they will be, trust me! I still make bisciuts to this day for my adult kids and grandchildren!!! Just made these to go w/Asparagus soup. Had another one with Cherry Rhubarb jam. Just perfect. There is nothing better than a homemade biscuit!! Those look unbelievable and really take me back to my childhood. I’m from Texas and that’s pretty much how we make homemade biscuits too. Thanks for the trip down memory lane. My grandmother and my mother use to make biscuits like these. Such good biscuits and such good memories, as they are both gone now. What a lovely memory, thanks for sharing, it brought tears to my eyes. Missing my mom and dad this Memorial Day weekend. Thankfully, the happy memories do so much to soften the missing of them. And, the biscuits, oh my, am such a biscuit lover, will have to make some catheads real soon. love to make them to been making them forever seems like. just like my mom taught me to toke awhilee to be perfect at it but good eating. just like my grandma’s my aunts and my mama’s biscuits – everyday at every meal! This is the way I learned to make biscuits. My Grandma always made them this way. You can make the dough a little bit wetter and drop them into well greased muffin tins, too. They don’t look as good but they taste the same. this sounds very similar to my momma’s recipe…she made her’s in a wooden bowl..the biscuit bowl…you sisfted your flour into the bowl and then balled you fist and “rolled”it to make a small bowl in the flour then add your buttermilk, salt and melted shortnening and begin to stir and incorporate the flour into the wet mixture until it just holds together…then turn it out on a floured boaed, fold just enough flour in to hod together, roll out and cut , have your pan ready with melted shortening or oil in bottom enough to turn each biscuit as you pplace in pan, with sides touching, so they will rise up nice and tall..then bake in a hot 400-450 degree oven until light and nicely browned on top…serve with whatever and enjoy!!!!! Oh, the memories….my daddy taught me as well….they both made wonderful biscuits!!!!!!! Those look amazing. And your house growing up sounds like one tasty place. My grandmother always made these (actually her best “dish”!!) altho both her daughters could cook like a house afire. The reason they are called “cathead” biscuits is because they are big as–wait for it–cat heads! (At least that’s what we thought.) Only in the South would we name something like this (think ‘hushpuppies’). I have always known that Catheads got their name like that too….as big as a cat’s head! I can’t say that I have had this kind of biscuit before, but they sure look mighty good. I love my mama’s biscuits, I don’t think they are far off from yours. I think there is something about watching your mom making biscuits that is one of the true joys in life. I look forward to giving this ago, and while strawberry jam was always on our table we just might have to have a “cathead” version this time around.